TUSCALOOSA, Ala. (WLS) -- Pomp and circumstance, proud parents, and motivational speeches - Paul W. Bryant High School's ceremony sounds like any other graduation. But this one was a little different. 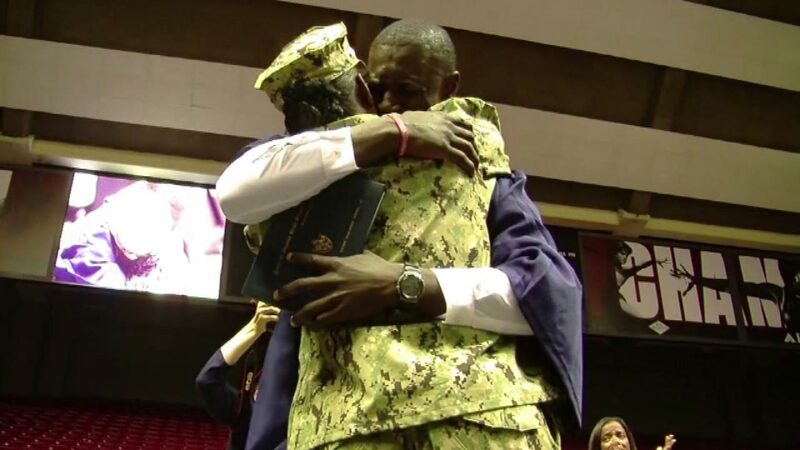 One by one, names were called and students walked across the stage to get their diploma, until a pause before calling Steven Turner Jr.
"I got really worried and nervous, I thought she forgot my name," Turner said. But on stage there was more than his diploma waiting for him. His mom, Petty Officer 2nd Class Vera Turner, was there. She has been deployed in Guantanamo Bay for the last nine months. She had originally told her family she wouldn't be able to attend her son's graduation, but planned the surprise with the school district. "It means so much to me, it means the whole world. I thought she wasn't going to make it," Steven Turner said. But she turned out to be the best graduation gift he could have received. "All he could say was, 'Thank you, Mama, thank you, I love you,'" she said.